In Chile’s Lake District, pristine wilderness, crystal-clear rivers, traditional artisans, and luxurious lodges reveal themselves in splendor—and, for Joyce Maynard, offer a fortifying renewal of spirit. "Orion's upside down," I told my husband. Fifteen hours of airplane travel had landed us at Lake Villarrica in Pucón, Chile; I was lying flat on a wooden dock, staring into the darkness with Jim at my side, no sound but the water lapping at the rocks by our feet. The Big Dipper was nowhere to be seen (wrong hemisphere), but thanks to the lack of ambient light, there were more stars visible overhead than I even knew existed. Not only were the Southern Cross and Sagittarius thrillingly clear and bright, but for the first time in his many decades of studying the night sky, Jim had just spotted something called a Magellanic Cloud—a whole other galaxy beyond the Milky Way. A thought came to me: If one function of travel is to offer an entirely new perspective on our world, it had served its purpose here. For some people, the vastness of the galaxy and the knowledge of how fleeting our time is on this planet—how fleeting our planet’s time is, even—might be a source of sadness, but to me it was a comfort. Nothing in life seems quite as huge or life-shattering when you’re looking up at a Magellanic Cloud. Back to Pucón—part of a region of Chile known as the Lake District. To North Americans, at least, the Lake District is a lesser-known region of this long, narrow country of gloriously diverse landscapes. This is not the Chile of penguins and glaciers, as in Patagonia, or the vast desert of Atacama, or the weirdly haunting stone faces of Easter Island. And yet there’s more to the Lake District than lakes. It is a vast, unspoiled wilderness surrounded by mountains, including the Andes. There are rivers so clear you can practically count the gills on the fish. And about those fish: at that very moment, one leapt out of the water, breaking the silence. But just barely, and just for a moment. Then stillness returned. 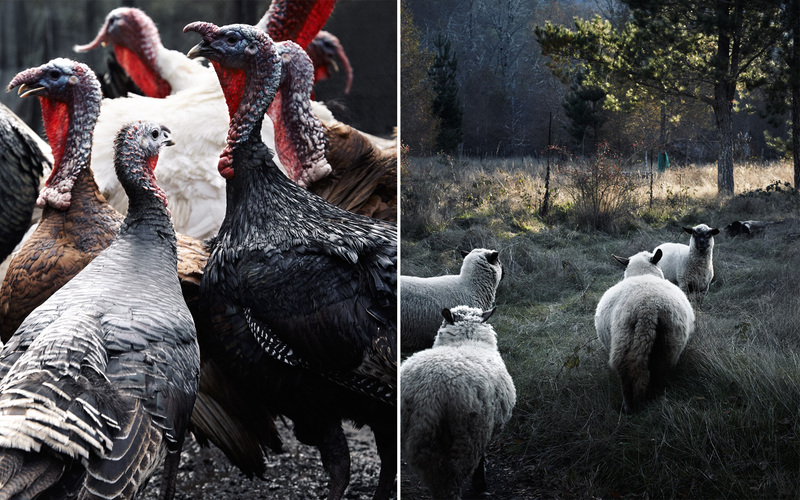 From left: Vira Vira’s turkeys; Sheep from one of the ranches that blanket the Lake District. For now anyway. Let’s not forget the volcanoes. One of which—Villarrica—had been steadily emitting dark, ominous clouds of smoke from its crater ever since we arrived here, three days earlier. In the village of Pucón, residents were uneasy, remembering stories from the last big eruption in 1984. But from the edge of this dock where Jim and I came to watch the stars, and from our room at the historic Antumalal, perched high on the rocks overlooking the lake, we could observe the drama without the danger of close encounters with molten lava. We made this trip to Chile at a challenging moment in our lives. Four months earlier, my 62-year-old husband had been diagnosed with pancreatic cancer, and since then, he’d been undergoing what may well be the roughest chemotherapy cocktail ever cooked up, in hopes that it would shrink the tumor to the point where it could become operable. The cancer and its treatment had taken 25 pounds off Jim, and left him with a long list of symptoms he seldom complained about, though the effects were clear. My active, hiking, mountain-biking husband had become very thin, and more tired than usual, though in no way defeated. We did not view this trip as some final hurrah. For us, it served as a way of storing up our energy for the next round of treatment, and giving ourselves a reminder (in case we needed one) of all the experiences still ahead of us, if Jim could just get through this one. Chemotherapy is one form of medicine. But a great trip, in my opinion, can be another. We touched down in the capital of Santiago just long enough for an evening lesson in Chilean cooking, a quick ride up the funicular, and a visit to Pablo Neruda’s house, before boarding an hour-long flight that brought us to Temuco, a small city that serves as the gateway to the Lake District and is a couple of hours by car from Antumalal. The hotel opened its doors to guests in 1950. And though it has been renovated over the decades—the pool improved, the gardens expanded—the year could be 1958. Every detail of the original groundbreaking, Bauhaus-inspired design, from the Midcentury furnishings to the soaring stone fireplace, has been preserved. Other than the sight of a few iPhones, nothing would look different from how it was when Jimmy Stewart, Adlai Stevenson, Barry Goldwater, and a young Queen Elizabeth came here to fish. The original owners, Guillermo and Catalina Pollak, are dead now, but the place has remained in the stewardship of their daughter Rony (now age 65) and her son, Andrew, who picked us up at the airport in Temuco. On the drive to Pucón, Andrew told us the hotel’s story. 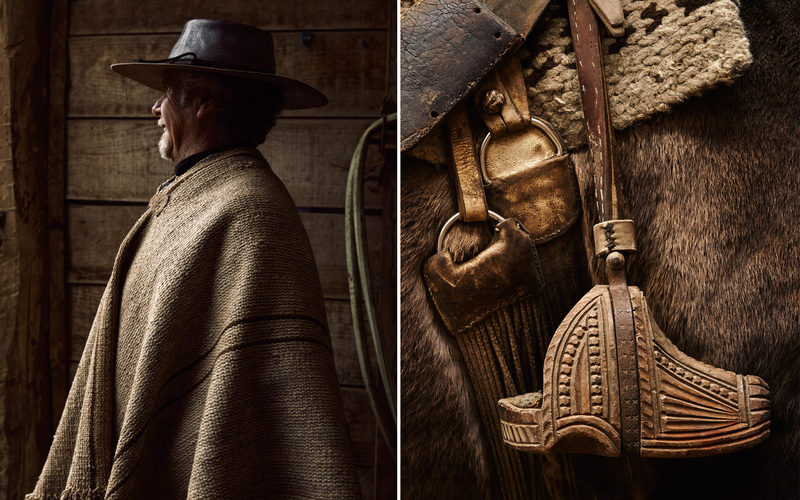 From left: Rodolfo Coombs at his stable, near Vira Vira; An intricately carved traditional Chilean stirrup. In 1939, Guillermo and Catalina were newly married, still in their twenties, when they made the decision to emigrate here from their native Czechoslovakia, where (along with thousands of other European émigrés to South America) they fled the specter of Nazism. They landed with no money and not a word of Spanish. Some people might have seen this as a kind of exile, but photographs of the Pollaks, taken the day they left Prague, make it clear that for them, the prospect of making a new home in South America was a grand adventure. 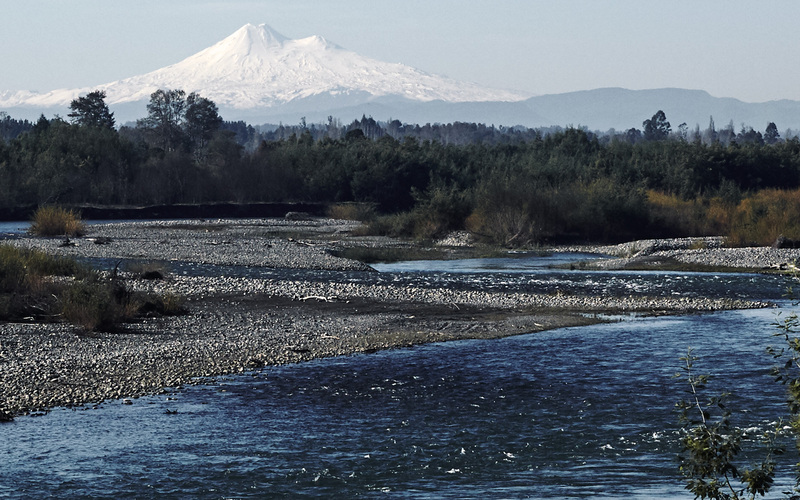 They traveled around for a while before settling on this part of Chile as the place that offered the most possibilities for a life of hiking, skiing, fishing, and unbridled opportunity. For nearly a decade the couple worked around Pucón, taking odd jobs, running a ski resort that eventually burned down. In the late 1940s, despite limited resources, they managed to buy a piece of spectacular property on the shores of Lake Villarrica. The price was low because with no waterlines to the high rock promontory overlooking the lake and volcano, building seemed impossible, and anyway, there was little tourist industry in the area at the time. One day in 1948, the president of Chile stopped by a teahouse the Pollaks had built on the property, and Guillermo persuaded him to approve a government loan of $5,000 to build a hotel, making the case that the area would one day serve as an important center for Chilean tourism. With that money, the Pollaks hired a Chilean architect, Jorge Elton, and built a radically modern 20-room hotel. Sixty-five years later, the design appears no less iconic. In a world of infinity pools and Jacuzzis, the style of Antumalal stands out as refreshingly simple: stark, clean lines; wide, smooth boards of monkey pine; handwoven textiles and muted colors; glass walls angling out like the prow of a boat, to maximize views of the lake and volcano. Imagine going to sleep at night in Frank Lloyd Wright’s Fallingwater, and you’ll have an idea of what makes a stay at Antumalal such a powerful experience. Out on the deck beyond the dining room, watching the sunset one evening, I tried to imagine how it could have happened that a young and virtually penniless couple unschooled in Spanish, let alone architecture and construction, could have made this bold design choice. If I were in need of examples of couples triumphing in the face of big challenges, I didn’t have to look further than the story of Guillermo and Catalina. For guests who choose to explore the area, the staff will arrange outings—boat trips, or fishing, an expedition to the thermal pools, or (when it’s not erupting) the volcano. It’s also an easy walk from the hotel to Pucón, where you can shop for azurite jewelry (a specialty of the region) or sample kuchen and fine Swiss chocolate. We paid a visit to a weaver who makes gorgeous rugs from natural, hand-dyed yarn—and after navigating Jim’s and my different color preferences, we ordered one, custom-made, to be shipped to us. But you don’t come to the Lake District primarily for shopping or cuisine. You come for the natural beauty of the place, and the wildness of a largely undeveloped landscape. Here at Antumalal we discovered that it was not only the night sky that got turned upside down for us, but the perspective from which we viewed life on the ground, too. 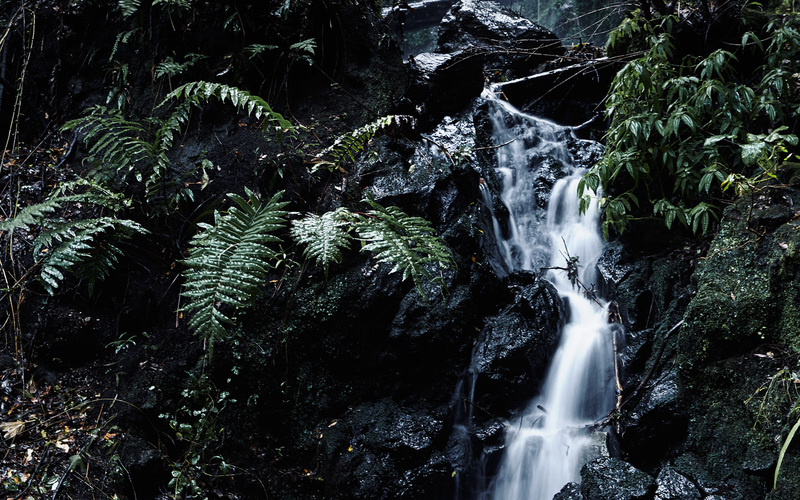 Residents of Pucón live next to a volcano that could blow anytime, but they carry on with their lives in the meantime, as Jim and I found ourselves able to do, too—slowing down the pace of our days, taking note of everything. We observed the spectacle of a tree filled entirely with parrots. I went for latenight swims in the lake. We drank a glass of good Chilean wine every night while watching the final minutes of sunset. The dinner menu didn’t appear to change much, but we didn’t mind. I could eat Lake Villarrica trout three nights in a row. And I did. From Antumalal, Jim and I made the 20-minute trip to the Hacienda Hotel Vira Vira, set at the edge of the Liucura River, whose waters ran right alongside the door to our airy room, with its outdoor bath and a view of open fields and grazing horses as well as an astonishingly diverse population of birds. Like Antumalal, Vira Vira is a family-run hotel, but this one opened its doors only months ago. It’s the creation of Michael Paravicini, a Swissborn businessman who first visited the region and fell in love with it when he was 15 years old. Paravicini spared no expense in realizing his vision. In addition to the hotel, Vira Vira houses a substantial organic farming operation that supplies the majority of the greens and vegetables used by the restaurant, as well as a flour mill, beehives, flocks of chickens and ducks, and even wild boar, as well as a state-of-the-art cheese-making facility, all open to guests. Whereas a stay at Antumalal inspires lounging, Vira Vira calls its guests to venture forth and explore. The hotel has on its staff a whole team of specialists in a wide range of adventures: guides knowledgeable in fly-fishing and horseback riding, drivers ready to bring guests to the remote areas inhabited by the region’s indigenous people, the Mapuche, and—in the winter months—guides for ski trips on the volcano and sleddog excursions. We decided to take off in a boat manned by a guide named Mario, who has fished this stretch of river since he was a child and knows every bend and, more important, every spot in the river where the trout and salmon are likely to bite. Not much of a fishing aficionado myself, I went along on this one mostly for the sake of Jim, a flyfisherman. But 15 minutes into our journey down the river, when I felt a tug on my line, my heart started beating wildly, and I was suddenly consumed with a fierce and unfamiliar compulsion to reel in my catch. After a hike the next day, Jim and our guide and I stopped for a meal at a place a person might never know to stop, if not in the company of a local—a traditional Mapuche restaurant run by a woman named Anita. She wore a bandanna over her black hair as she served up an array of selections seasoned with spices we’d never encountered: mudai, a drink made with corn, a bowl of roasted pinyon nuts from the monkey pine tree, a salsa called pebre, and some particularly delicious cochayuyo, a species of kelp popular in Chilean indigenous cooking. The spice used in many of these dishes, merken, imparts a rich, nutty flavor—it’s not hot, like a lot of Latin American fare is. I could not come up with a single North American dish that resembled in any way what we were served that afternoon—foods I could imagine having been served around a fire, hundreds of years earlier. Though neither of us is an expert rider, it became a goal for me to ride into the mountains—not as high as the group of Brazilian equestrians who were staying at the hotel, maybe, but I wanted to take in the breathtaking countryside from the back of a horse. Our guide, Patricio, brought us to a nearby stable and saddled up a pair of fine-looking steeds. This was not a standard trail ride, the kind that takes a person—clippety-clop— along a featureless, well-trod path. Our Lake District horses and guide took us up into the foothills of the Andes, through terrain so dazzling and devoid of any signs of other humans that I imagined I was a cowgirl, out on the range, reaching my hand into the brush now and then for a handful of the best blackberries I’ve ever tasted. Even when we climbed steeply, our horses betrayed no sign of unease, and because of that, neither did I. 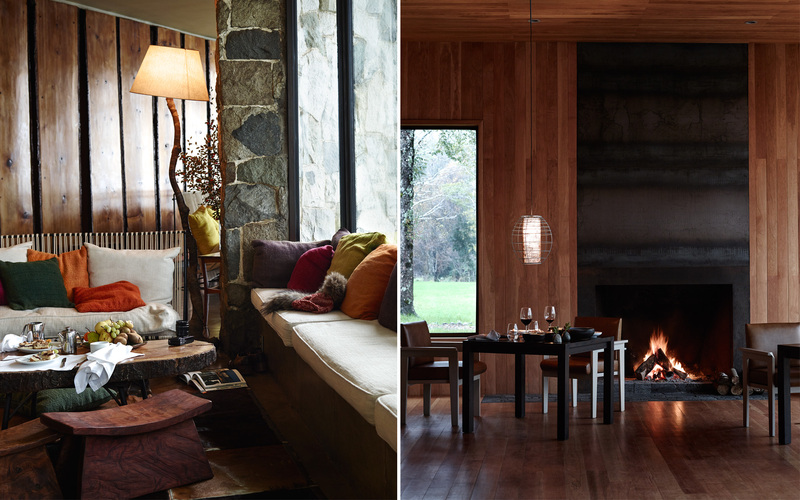 From left: In the lounge of Antumalal; The dining room at Vira Vira; the kitchen sources ingredients from the property’s organic farm. Emboldened, we inquired about a hike we’d heard Patricio describe to a peak called San Sebastián. The guides warned us it would be a tough one— starting at 6,000 feet and climbing to 12, with stretches of rough terrain along the way—but also, some of the most spectacular vistas in all of the Lake District, or beyond. From the top of San Sebastian, Patricio told us, you can see four volcanoes and five lakes, and past that, Argentina. Even Michael Paravicini himself had not yet tackled this one, they told us. As for who had: Well, said the guide. “Sólo para los valientes.” Only for the brave. I looked at Jim—10 days into his fifth cycle of chemotherapy, 120 pounds, last we checked, though I think Vira Vira and Antumalal had put a few more on him. “We’re doing this,” he said. So we did. We expected the hike to be spectacular, but nothing prepared us for the forest of soaring virgin monkey pine we encountered a few hours up the trail, or the craggy spires of rock beyond it, where even in Chile’s late summer some remnants of last winter’s snow remained. And still we climbed. He didn’t say anything, but I knew Jim was growing weary. So was I. We took small steps, one foot in front of the other, and at one point there was no way to climb but on all fours, grasping at roots and branches, scrabbling in the dirt as we ascended. But we didn’t stop. We were six hours into our journey when we reached the summit, and I was more exhausted than I have ever been. Knowing how long the trek back would be, we couldn’t linger long at the top, but there was no way to leave this place without recording our conquest. Patricio had us stand at the edge of a high boulder beside a drop-off that plunged straight into an abyss. “Don’t look down,” Jim said to me. I’d spent the week marveling at the night sky and the stars, but here at the summit of San Sebastián, the view seemed as endless as the heavens: distant peaks, sky, clouds, lakes stretching all the way to Argentina. It was not a melancholy thought, but rather an oddly comforting one, to know how small the two of us were in the scale of these mountains. All my life there have been certain moments when I stopped and told myself “remember this.” Now, dusty and aching, drenched with sweat, with Jim’s arms around me, standing over the abyss—a spot both terrifying and glorious, where if you took three steps back you’d be at the bottom of a crevasse—was one such time. “I will think back to this day when a very hard day comes,” I told myself. Llaima volcano, one of several in the region. We made it to the top of San Sebastián. What could seem impossible after that? It was dark when we got back to Vira Vira. We staggered up to the bar for our usual pisco sours, then dinner. Lamb chops, cooked exactly right. Wine from the Carmenère vines. No meal ever tasted better. Next morning, early, we made the two-hour journey back to the airport in Temuco, and from there, back home. Five days later we were in the office of Jim’s surgeon in Boston, listening to the report on his CT scan. The tumor had shrunk by 50 percent. Surgery was now possible. We didn’t need him to remind us it would be tough and very painful, with a long recuperation. What would happen after that, impossible to say. As with all the best trips, you never fully know what’s going to happen until you get there, and when you do, there’s always the next stop along the way.